Paul's Landing at the Vinoy in St Pete Keeps it Local, Fresh and Delicious! Paul’s Landing at the Vinoy Renaissance Hotel is executive chef Matthew Brennan’s stylish brasserie billed as a social landing spot featuring locally crafted provisions. It’s the perfect spot to gather with friends over cocktails, enjoy live music on Friday and Saturday nights, take in the stunning downtown waterfront scenery and sample food that is almost entirely sourced close to home. Old St Pete Distillery created bespoke gin, rum, and vodka that serve as a basis for hand-crafted cocktails. 3 Daughters Brewing created a citrus IPA just for them. Mother Kombucha is available on tap. Selected seafood comes from local dayboats and Brick Street Farms romaine fills the bowl of the Caesar salad. Even spices that ignite the flavors of most dishes are blended by hand by a local spice shop. 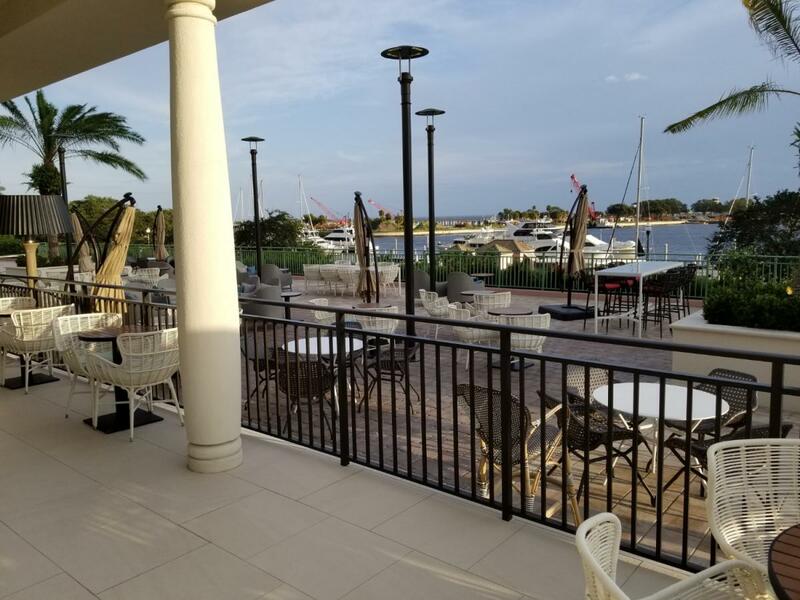 Paul's Landing keeps it local, fresh, and delicious and it's a jewel in the crown of the downtown waterfront and the entire Tampa Bay area. Shrimp Toast at Paul's Landing is a flavor and textural masterpiece. Whether enjoying cocktails on the open terrace or a starting point for dinner, the appetizer section of the menu has something for everyone. Edamame hummus and seared tuna are featured along with their award-winning shrimp toast. 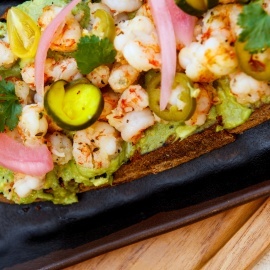 The shrimp toast starts with a slice of house-recipe sourdough bread that is grilled and topped with an avocado spread and loaded with tiny rock shrimp. Then it’s finished with a collection of house-made pickled vegetables. The vegetables are tender-crisp with a bright acidic flavor and color that makes this dish special. This is a flavor and textural masterpiece that combines crunchy with creamy and sweet with tangy. Chicken wings are marinated in a citrus wheat beer and smoked over pecan wood before getting a dusting of citrus-chili rub. Paul’s Landing has taken the humble chicken wing and elevated it to a new whole new level. If you are a seafood purist and enjoy it simply prepared with only a squeeze of lemon and cocktail sauce, then the seafood tower is for you. It can be ordered for two, four or six people and includes lobster tails, colossal shrimp, seasonal oysters on the half shell, stone crab claws and tuna poke. The sushi-grade tuna was sublime, gently tossed in a key lime and soy marinade. I planned to pace myself throughout this dinner but after just one bite of the tuna, my plan went out the window. It was just too good to stop. The seafood tower is fresh and seasonal, simply prepared to showcase natural flavors. 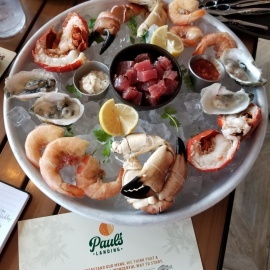 Smoked brisket, a daily butcher’s cut steak, and fried chicken are among the entrée selections but make no mistake, seafood is the star of the show at Paul’s Landing. Entrees featuring fish tacos and sandwiches are available but don’t overlook the grilled whole fish. The fish is seasonal and mine was a yellowtail red snapper. Skin on with the full head and tail, it was a show-stopping presentation, accompanied by a compressed watermelon and sweet corn relish. The fish was stuffed with citrus and fresh herbs then roasted. I easily filleted the fish myself, but it can be done in the kitchen upon request. Either way, the moist and flavorful reward is well worth any effort and just delicious! Sweet potato tots seasoned with smoked salt and smoked chili ranch dipping sauce create an adult version of the childhood favorite. Once you’ve tasted these tots, you’ll never go back to the kind that come out of your freezer. 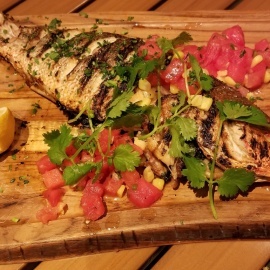 The Grilled Whole Fish is stuffed with citrus and herbs, accompanied with a compressed watermelon and sweet corn relish. The mark of a truly good restaurant is having a pastry chef on staff, and Paul’s Landing has that covered. Pastry Chef Michael Moreland has created signature desserts that dreams are made of. The Key Lime pie strays a bit from the classic version in two ways. First, it’s served in an individual lock-lidded glass jar that is lined with crushed graham crackers. Second, the key lime filling has a wonderfully smooth texture similar to a cheesecake which cuts the acidity of the key lime flavor. It’s like a key lime pie and a cheesecake had a baby! The balance is perfect, and it’s topped with raspberry and kisses of baked meringue that add a nice light crunch. 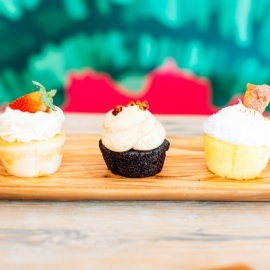 For a variety of tastes in one dessert, don’t pass up the cupcake sampler. This is three full-sized cupcakes, seasonally inspired and combined so all of the flavors complement each other. Our sampler included a vanilla cupcake with a strawberry filling and strawberry buttercream, a red velvet cupcake with cream cheese frosting and chocolate curls and a devil’s food cupcake with hazelnut buttercream. The cupcakes were light and moist and the hazelnut buttercream on the devil’s food cupcake was wonderful. The flavor was on point, provided the perfect foil to the chocolate cake and lingered for a few moments after each bite. A cool evening, a cupcake sampler, an espresso and a snifter of aged rum under the stars and the lights of the downtown skyline is a perfect nightcap after the theater or symphony. Cupcakes at Paul's Landing serve a sweet finish. On a list of requirements for a perfect restaurant, Paul’s Landing checks all the boxes. The food is skillfully prepared, texturally rich, locally sourced, seasonally focused and delicious. Bold, smoky flavors are balanced with mild and subtle ones to create bright and balanced dishes accessible to everyone. The location just can’t be beat offering ever-changing views of Straub park and the waterfront as well as breathtaking views of the soaring St. Petersburg skyline. It’s perfect for every occasion and style, it's local, fresh and delicious and a jewel in the crown of the Beach Drive scene. Paul’s Landing is located at 501 5th Avenue Northeast and is open daily from 11 am to 9 pm Sunday through Thursday and from 11 am to 10 pm on Friday and Saturday. To contact them for more information or to make reservations, call 727-824-8007.